To evaluate the diagnostic potential of susceptibility-weighted imaging (SWI) for the detection of erosions of the hand, compared to T1-weighted (T1w) magnetic resonance imaging (MRI). Computed tomography (CT) was used as a reference standard. We prospectively investigated 37 patients with suspected arthritic activity of the hand. All patients underwent T1w, SWI, and CT on the same day. Patients were randomized to MRI or CT first. CT, T1w, SWI, and T1w/SWI were scored for erosions according to OMERACT RAMRIS guidelines. Specificity, sensitivity, and diagnostic accuracy were separately calculated for T1w, SWI, and T1w/SWI on a per-patient and per-bone basis using CT as reference. The one-tailed McNemar test was performed to test the number of erosion-positive patients in T1w, SWI, and T1w/SWI for non-inferiority. Measured erosion sizes were compared using Pearson’s test. CT was positive for erosions in 16 patients and 55 bones. SWI and T1w/SWI had superior diagnostic accuracy (91.2 and 93.8%) compared to T1w (87.8%) driven by a higher specificity (93.8 and 96.5%) compared to T1w (88.8%). On the patient level, SWI and T1w/SWI showed non-inferiority (p = 0.11 and p = 0.38) but not T1w alone (p < 0.0001). The lesion size on CT correlated better with SWI (Pearson’s r = 0.92) compared to T1w (r = 0.69). Adding SWI to a standard MRI protocol has the potential to improve erosion detection in hands by increasing specificity. 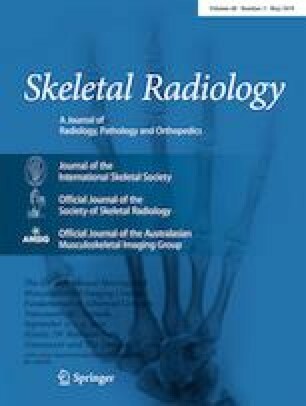 SWI depicts bony erosions more accurately compared to standard MRI techniques. The online version of this article ( https://doi.org/10.1007/s00256-018-3116-0) contains supplementary material, which is available to authorized users. The authors thank Mrs. Bettina Herwig for language editing.